Read our round up of the week's news, each with links to the full story. Nikon is boasting good profits despite the general economic downturn, while it's new Nikon 1 mirrorless system has received "stronger than expected" pre-orders. We're still putting together the full review of the Nikon 1 system cameras, but you can take a look at our labs data for the Nikon V1 and the Nikon J1 to see how they stood up to our tests. Next up, Fujifilm, which announced this week that it too would be entering the compact system camera market. 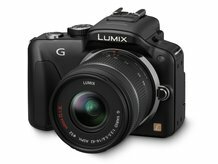 The manufacturer was less clear on specifications, but did confirm that the camera will not be Micro Four Thirds or the same size as any other CSC on the market. Fujifilm's mirrorless camera won't be announced proper until CES in January 2012, but see here for everything we know so far. On Wednesday, Apple released its latest iPhone. The 4S contains a much improved camera. With everyone and his dog owning a camera phone these days, it got us wondering if budget compacts could be on their way out. Read on to find out more, and add your own opinions. Finally this week, legendary photographic brand Kodak strongly denied rumours that it was about to file for bankruptcy amid increasing rumours of its future. That's it for this week. Tune in next time for more from the world of photography technology, and be sure to let us know your opinions over on our Twitter feed.